Isn’t that sweet? Kaley Cuoco's husband is more positive since saying I do! 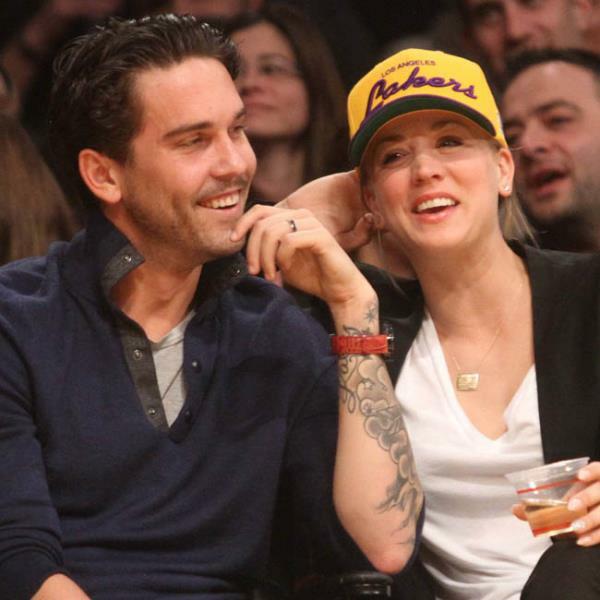 Kaley Cuoco's husband Ryan Sweeting says he is a more positive person since they got married. She must be doing something right! Kaley Cuoco has made her husband a more positive person. Ryan Sweeting, who married The Big Bang Theory actress on New Year's Eve after a whirlwind six-month romance, instantly knew the blonde beauty was his soul mate and feels like their first blind date never came to an end. The 26-year-old professional tennis player told reporters at Delta Airline's Grammy Weekend party in West Hollywood that his "whole outlook on life" is "a lot more positive" since he got married. "We couldn't be happier. It's the best, the best, moments of our lives." Asked how he knew Kaley (28) was the woman for him, Ryan admitted: "I had never really felt that feeling before, really. The second I got here I didn't want to go home. We spent every minute together, and I still haven't left from our blind date." The couple were spotted cosying up to each other as they watched a private performance by Royals hitmaker Lorde at the bash. Ryan recently had his wife's first name and their wedding date tattooed in a heart on his left forearm, while the actress changed her name on Twitter to Kaley Cuoco Sweeting.